Want more detailed information about our Products? Read about our Products, as well as useful How To Guides, Reviews, and details about our VIP Customer Rewards Program. Clip In Dreadlock Ponytail Black/Purple. 230grams each. Be fun! Be daring! Be wild! Bring out your wild side with these fun to wear Clip On Dreadlocks. Always wanted to have dreadlocks but didn't want to commit to the real thing? 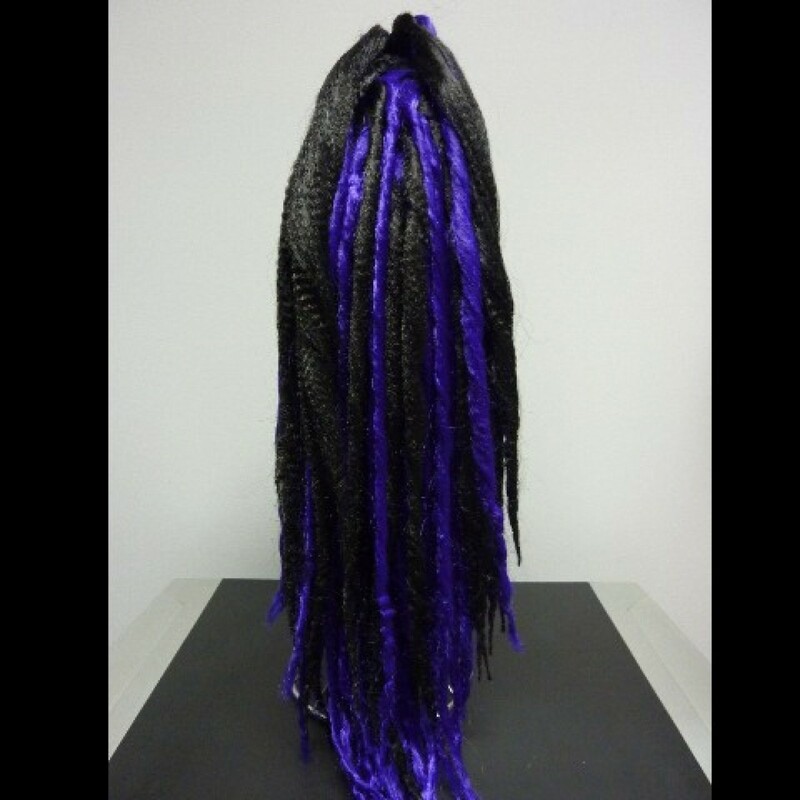 Well now you can, with our gorgeous Cleopatra Clip On Ponytail Dreadlocks. 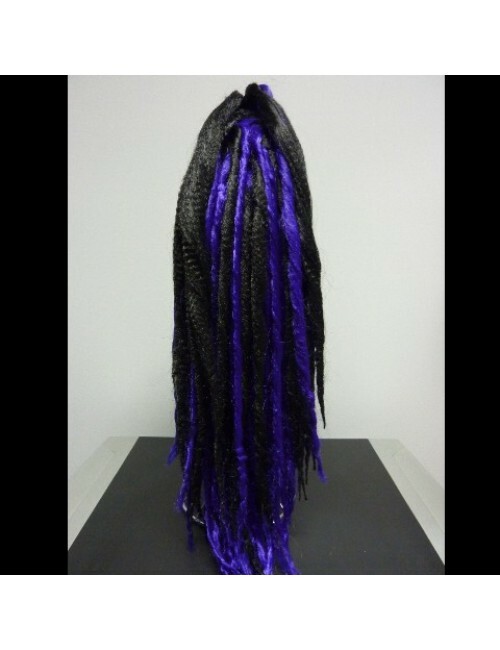 The dreadlocks are very thick and full, and are a fun way to be that little bit different! The dreadlocks are attached to a strong Alligator Clip and simply clip on over your existing ponytail or bun. Available in a range of 16 colours. Go on be daring!! We know when you make the decision to order you want your new Hair Extensions FAST! We send all our parcels using Australia Posts - Express e-Parcel Service, or Regular e-Parcel Service. Rural/Remote Areas will receive their parcel within approx 2-3 working days once posted. Regular e-Parcel Service: Most areas will receive their parcel within 3-7 working days once posted. Remote areas may take a few days longer. IMPORTANT: Australia Post do not guarantee an overnight service using the Express e-Parcel service. They just guarantee the quickest possible delivery service to your area as noted above. No refunds of postage will be given for delivery which arrives later than you expect it to. Once parcels are picked up from us we have no control over the delivery times and are therefore not liable for late delivery. We will post to PO Boxes however you must also supply your full street address in the "Billing" section of the checkout. Put your PO Box delivery details in the "Shipping" section of the checkout. Once an item is delivered it is registered as delivered on the Australia Post website. Once Australia Post update their information to delivered, we will under NO circumstances resend a parcel. If a parcel goes missing after it is shown as delivered by Australia Post we will help you to lodge an investigation at your local post office or Australia Post. We will not be held liable for any missing parcel shown as delivered by Australia Post. NB. It is the customers responsibility to ensure that all contact and postal details are correct on your order (including spelling). If an item is returned to us due to incorrect contact/postal details then we will request that postage is repaid to enable your parcel to be resent. If incorrect details are supplied and we have already sent your parcel and it goes missing we will not offer a refund. Keep in mind that we send parcels out quickly (sometimes same day, although not guaranteed) so please, double check all details carefully and contact us as soon as possible if you find a mistake. NB: We will not be held responsible for late delivery, and no compensation of any kind will be entered into for late delivery. We post all parcels within 1-2 business days (sometimes same day but not guaranteed). Delivery time is then totally in then hands of Australia Post over which we have no control. We can not advise a time when your parcel will be delivered. If you need delivery by a certain day we suggest placing your order early to allow for any delays on the part of Australia Post. Delays sometimes do occur with Australia Post due to fog at airports, flood, and courier truck breakdowns. In our experience it doesn't happen very often, but it does happen. **IMPORTANT: If you are a first time customer with us and your order is over our security limit then we may email to ask for more information from you. In some instances we will refund a small amount back to your credit card as a security measure. We will then require you to contact us by email to verify the amount that we have refunded. Only the card holder will have access to this information so it is a secure way to verify the card as recommended by most banks. This will normally only delay your order by 24 hours. You will not be asked to do this on future orders with us. Delivery Time: 10-14 business days $25.00 (AU$) flat rate no matter what you buy. Please allow 24-48 hours to receive your tracking number via email. International Orders can take up to 48 hours for us to dispatch, and delivery times are given based on the dispatch date, not the order date. We do accept exchanges from International Customers, however all shipping costs involved in the return process (both ways) will be the responsibility of the buyer. NB. It is the customers responsibility to ensure that all contact and postal details are correct on the order (including spelling). If an item is returned to us due to incorrect contact/postal details then we will request that postage is repaid to enable your parcel to be resent. If incorrect details are supplied and we have already sent your parcel and it goes missing we will not offer a refund. Keep in mind that we send all parcels the same day so please, double check all details carefully and contact us as soon as possible if you find a mistake. Once your parcel has been posted we can not correct any details. We urge you to read this prior to purchase. We charge a 15% Restocking Fee applies to all hair extensions which are returned for Refund. A restocking fee of 15% also applies to all orders regardless of if the order is cancelled prior to sending or not. Postage Costs are also not refundable. We do not refund for change of mind or incorrect colour choice. We will exchange for another colour if colour is not correct, however all postage costs involved are at the buyers expense. Can I Exchange if the colour isn't right? Yes, we totally understand that it can be difficult to choose the correct colour when ordering online, so we are more than happy to exchange your unopened Cleopatra Hair Extensions for another colour. For hygienic reasons we are only able to exchange hair extensions that have not been opened, worn or tampered with. Our products all have a security binding and once removed we can not exchange under any circumstance. All products must be returned to us in their original undamaged packaging and condition. All costs associated with the exchange are at the cost of the buyer. When sending extensions back for exchange please send via a fully insured trackable method and make a note of the tracking number. It is your responsibilty to ensure they arrive back to us safely. If a parcel is lost on its way back to us we will not be held responsible and you will have to contact Australia Post, or your shipping provider with your tracking number, and claim on their insurance. Is there a time frame to qualify for an exchange or refund? Yes, we will refund or exhange your unopened/unworn hair extensions within 14 days of the date that you received your hair extensions for Australian Customers. For International Customers the exchange or return must be received by us within 30 days. Why can't I return or exchange Cleopatra Hair Extensions if they have been opened? All human hair extensions are considered a hygienic product, just like swimwear etc. Australian law prohibits the return of used human hair products, including "trying them on". We strongly suggest you inspect your hair extensions before removing the bindings to make sure they are the correct colour, and the quality you expect. Once the bindings have been removed they can not be returned for refund or exchange (no exceptions). We are not the only company with this policy. All other hair extension companies will not exchange or refund opened product. Hair Extensions that have been coloured. Under no circumstances will we exchange or refund hair extensions once they have been coloured. Colouring is at your own risk, and as such if it goes wrong, we are under no obligation to refund or exchange. There are too many different products for us to guarantee which ones will or won't work. Some products can and will cause damage to hair extensions as they are too harsh. Many customers have coloured/toned their hair extensins, however you take all responsibilty for hair that has been coloured if you do decide to colour/tone the hair. What do I do if I need to exchange? 1. Please contact us first at info@cleopatrahairextensions.com.au with the reason you would like to exchange or return your item. Please do not send back your parcel until you have heard back from us. 2. Include a copy of your invoice, or a note with your full name, address, email address, phone number, and order number. This ensures we can locate your order and all details. 3. Safely package the unopened hair extensions so that they are not damaged. 4. Please make sure to send them back using a postage method that insures you for the full cost of the item. Cleopatra will not be held responsible for lost or misdirected parcels. 5. Please include a self addressed express satchel for us to send your exchange to you. 6. Once your return item has been received your exchange item will be posted back to you the same day. All items must be returned in their unopened, original, undamaged packaging or an exchange/return will not be issued. Who is responsible for return postage costs? You the purchaser are responsible for all costs involved in the process of an exchange/return. When sending product back for exchange we recommend you send via a fully insured trackable method and make a note of the tracking number. It is your responsibilty to ensure they arrive back to us safely. If a parcel goes missing on its way back to us Cleopatra will not be held responsible. Australian Customers may include a self addressed express post satchel for us to send you your exchange, or we can contact you when we receive the return and organize payment for the return parcel if you wish to use our courier. International Customers will be sent a Paypal invoice for the costs involved in sending back your exchange. Do I have to return my free gift? If you are returning the product for refund, then all free gifts should be included to qualify for a full refund of your products purchase price. If gifts are not returned we will keep $10 from your refund amount. If you are exchanging then you may hold onto your free gift. If I am sending back for a refund do I get a full refund? How long will it take for me to receive my exchange? Once we have received, inspected, and confirmed that the returned hair extensions were not opened and taken out of the cardboard backing and that the security seal is still in place, we will send out your new colour within 24 hours. Under no circumstances will we send out your exchange until we have received your original returned parcel. All items must be returned in their unopened, original, undamaged packaging or an exchange will not be issued. How long will it take for me to get my refund? Once we have received, inspected and confirmed that the returned hair extensions were not opened and taken out of the cardboard backing and that the security seal is still in place, we will issue a refund minus postage costs to your original payment method. Most refunds are processed within 48 hours of the your return being received by us. All items must be returned in their unopened, original, undamaged packaging or an exchange will not be issued. I ordered a bulk lot, or discounted/sale/clearance item. Can I still receive a refund or exchange? No, we do not issue refunds, or exchanges on bulk purchases or discounted/sale/clearance items. Please choose carefully before ordering one of these products as all sales are final. We recommend you trial one of our products before placing a bulk order to make sure it is suitable for your needs. What happens if something is wrong with one of the clips on my clip in hair extensions? We include two spare clips with all purchases of clip in hair extensions. If you find you have a faulty clip they can be replaced very simply by unstitching the faulty clip and restitching another clip in it's place. We do not send out replacement hair extensions in the event of faulty clips. What happens if my Clip In Hair Extensions are shedding? All Clip In Hair Extensions will and do shed. This is normal. It is impossible for all hair to be permanently caught within the stitching. Refunds will not be given for shedding hair as it is considered normal. Some sets shed more than others. To minimize shedding we strongly advise the use of a weft bond glue (wig glue). Place this on both sides of the weft at the top along the width of the weft. Shedding will still occur but it will be greatly reduced. Returns: Please see our Returns Page our full terms and conditions regarding returns. We charge a 15% Restocking Fee on all items returned for a refund. A 15% restocking fee also applies to all cancelled orders regardless of if the order is cancelled prior to sending or not. Postage costs are also not refundable. We do not refund for change of mind or incorrect colour choice. We will exchange for another colour if colour is not correct, however all postage costs involved are at the buyers expense. Brushing: Always use a Hair Extension Loop Brush or Detangling Brush when brushing your extensions. A Loop or Detangling brush will not tug or tear at your extensions, and is gentle on the hair and your scalp. Always brush from the ends up to the roots and gently detangle any knots as you go. Use a wide toothed comb to detangle any knots at the ends. We suggest brushing your hair extensions 2-3 times daily. Do not comb or brush hair while wet. Washing: Avoid any products that contain Sulphur, Sulphate, Silicones or Protein. Do not use Dandruff shampoo on your hair extensions. When washing your hair tilt your head backwards and massage shampoo gently into the scalp area and let it wash down over your hair extensions. Condition your hair from the mid lengths to the ends. Always use a good moisturing shampoo and conditioner. You can even use a leave in conditioner if you wish. Do not apply conditioner to the scalp and bond area if you have Tape Hair. Argan Oil, or Moroccan Oil is great for hair extensions. Drying: Never twist or rub your hair extensions. This will cause the hair to tangle. Wrap your hair in a towel to remove excess moisture. You can then leave the hair to air dry or dry on low heat with a hair dryer. Always make sure to thoroughly dry the area where your hair extensions are bonded to your hair. Failure to dry this area properly will eventually break down the bond area and the hair extensions may slip from your hair. Straightening & Styling: Always use a heat protectant on your hair when using heat styling tools such as straighteners, curlers, crimpers, and hair dryers. Please ensure that your heat protectant does not contain silicone as this itself is damaging. Using heat styling tools on hair extensions can dry them out if used on too high a heat, or too often. It is essential to use a protectant on the hair to help minimize damage. Always use styling tools on a low heat. Colouring: We DO NOT recommend colouring your hair extensions as they have already been through extensive chemical processing, and to do so may cause damage. If you do choose to colour or tone your hair extensions we suggest taking them to a hair salon that specializes in hair extensions, and only using a semi colour on them. Colouring hair extensions is different to colouring your normal hair and extra care is required. Do not colour Tape Hair right to the top over the bond area as it will break down the glue. We take absolutely NO responsibility for any damage, or unwanted results caused by dying the hair extensions even if done professionally. Due to the processing that the hair is put through there may be a coating on the hair which may repell colour and not give the desired result. Colouring and toning will reduce how long your hair extensions will last. So will the use of Purple/Silver shampoos. These quite often contain sulphate. They can also give a patchy result. We suggest you choose a colour that is closest to your natural hair colour. Refunds will not be offered on hair that has been coloured or toned, or had the use of Purple/Silver shampoos, which results in an undesirable effect or hair condition. Swimming: If you are going to go swimming we suggest wetting your hair with tap water prior to entering the water, apply conditioner, and also braiding it. Salt water, and the chemicals found in swimming pools can decrease the longevity of your hair extensions. Immediately rinse your hair again once you have finished swimming. The best way to care for your extensions while swimming is a good old fashioned swimming cap! Yes we know it isn't attractive, but it works! Sleeping: Always brush your hair extensions prior to going to bed. We recommend tying your hair back in a loose ponytail or braid when sleeping. This will help to prevent matting as you toss and turn in your sleep. A silk pillowcase is also good. Do not go to bed with wet or damp hair as this will also cause matting as you sleep. Tape Hair: Do not wash your hair for 48 hours after application. This ensures the bonds have had time to adhere properly to your hair. If you are colouring Tape Hair do not apply colour to the bond area. Clip In Extensions: We recommend washing your clip in extensions only when required. They do not need washing after every use. The least amount of times you wash the hair, the longer it will last. Do not put them all at once in a sink to wash as they will tangle. Wash each piece on its own by gently placing it in water and running your hand down the length of the hair with shampoo. Repeat with conditoner. See our Blog for full information on washing Clip In Hair Extensions. How Long Will My Hair Extensions Last? There is no definate answer on how long your hair extensions will last as there are a lot of factors that come into play. Hair care & lifestyle affect the life span of hair extensions. Frequent washing will also shorten the life span of your hair extensions. For this reason Clip In Hair Extensions will generally last longer than the more permanent methods as they do not need to be washed as often. You do not need to wash Clip Ins very often at all and you are also not sleeping in them so they tend to last longer. As a general rule we suggest replacing your clip in sets every 2-6 months. Please note that all Clip Ins will and do shed. This is normal. If you wish to minimize shedding please use a weft bond glue on the wefts. This will dramatically reduce any shedding. Average use of the more permanent methods including Tape Hair, Easy Loops and I-Tips is 2-6 months. Some customers will get up to 9-12 months. These customers tend not to wash their hair as often, or go swimming, and do not colour or tone the hair. Storing Clip In Extensions: Gently brush your exensions after taking them out. Store them flat back in the pack that they came in if that is all you have. You can also roll them in a pillowcase and store flat in a drawer. Earn 100 reward points ($1)! Here at Cleopatra Hair Extensions we know that our customers demand the best quality hair extensions on the market. That is why we ensure we only stock the best human hair extensions that we are able to source from our supplier. © 2019 Cleopatra Hair Extensions. All Rights Reserved.